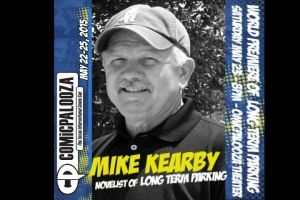 Mike Kearby’s beloved sci-fi/noir/gangster comedic novel that defies and parodies half a dozen genres is now breaking down the box office barriers with the release of the Long Term Parking feature film May 23rd at the comic-con convention in Houston, Texas. In today’s cinema, a world premiere in Hollywood is passé especially when the true fans are the 35,000 cosplayers vying for seats in the ComicPalooza Theater at the George R. Brown Convention Center. We reached Kearby at his Texas ranch by phone to ask about the film’s premiere and how the quirky novel came about in the first place. ES: You’ve written many novels, but none in this genre. What inspired the story of Long Term Parking?